Immediate Landscapes is very welcome as it sheds new light on a classic John Butcher album and addresses a significant omission from that release. Over ten days in June 2006, as part of a tour event known as Resonant Spaces, saxophonist Butcher visited six Scottish sites with extreme acoustic properties, including the cavernous Smoo Cave in Durness on the north coast and the vast Lyness oil storage tank on Hoy. Butcher's spirit of adventure and experimentation made him an obvious choice to play in such locations; in 2002, he and Japan's Toshimaru Nakamura, playing his habitual no-input mixing board, had been recorded in the highly resonant Oya Stone Museum in Utsunomiya City, Japan, the results being released as Cavern with Nightlife, on Butcher's own Weight of Wax label. In 2008, the Confront label released Resonant Spaces, containing nine ethereally-beautiful saxophone tracks recorded on the tour of the same name. That album was solely credited to Butcher, although the tour organizer's sleeve notes did mention in parentheses that Japanese sound artist and instrument builder Akio Suzuki had also been on the tour. There was no evidence of Suzuki on any of the album's tracks, but a contemporary article about the tour in The Wire featured him as prominently as the saxophonist. All of which leads nicely to Immediate Landscapess which is jointly credited to Suzuki and Butcher, and features five previously-unreleased duo tracks from the Resonant Spaces tour, as indicated by their titles, "Reservoir", "Mausoleum", "Cave", "Ice House" and "Oil Tank", totaling some thirty-two minutes. These five tracks display all the merits of those on the Confront album, with the addition of the playing of Suzuki and his interactions with Butcher. The sound artist employs a large array of sound resources, including pebbles, sponge, brass plate, noise whistle and far more, all contributing to soundscapes that are rich and varied without ever sounding cluttered. Once the resonances of the spaces are included, this leads to multiple possibilities � Butcher interacting with Suzuki, with Suzuki's echo and with his own echo, plus Suzuki doing likewise. In any improvisation, the performance space is ever present as an additional participant alongside the musicians; in highly resonant spaces, that element becomes far more prominent and significant, creating greater complexity and added fascination. Altogether, these five new tracks equal those previously issued, in some cases even managing to better them. Henceforth, Resonant Spaces and Immediate Landscapes should be considered as complementary companion albums, best heard together. Pleasingly, Immediate Landscapes is completed by an extended duo track, "Night Club", recorded live in Tokyo in 2015, in a club without undue resonance. The twenty-seven-minute piece presents a very different facet of the duo to that heard in the preceding tracks. It emphasises that Suzuki and Butcher are ideally-suited as an improvising duo, affording each other space in which to be creative while maintaining an equal balance between them. Their music fits neatly together like the pieces of a jigsaw, without either player having to abandon their trademark style. 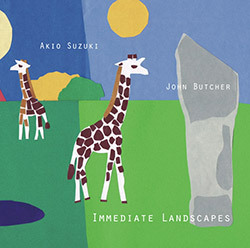 The entire album demonstrates that Suzuki and Butcher are a formidable combination and Immediate Landscapes deserves to be the first of many albums from the duo.